I have a lot of clients who are doing something new. One woman, an excellent songwriter and singer, goes out for auditions and writing sessions regularly. There are times when social media influences get the best of her. She experiences nerves and self-doubt coursing through her veins as she compares herself to friends and frenemies. Another client is applying to graduate school and has experienced a case of “imposter syndrome,” or the feeling that she doesn’t belong in the highly selective pool of Ivy League applicants (she fits right in). In both of these cases, we’ve processed feelings and I’ve given impassioned pep talks that are totally true about their skills. Both women have stressed about putting themselves out there. We’ve talked about the why’s and how’s of doing it versus not doing it. And it always boils down to the importance of going after what they want over fear. I get it. And now, it’s my turn to put myself out there. As many of my readers and friends know, about three years ago, I changed my therapy practice to a life coaching practice. This was a big step. I felt guilt, mixed with excitement and optimism. I felt guilty for having spent so much money on graduate school. I felt guilty for leaving psychotherapy. But then I also knew that this was the right thing for me, and my days were hopeful and exciting. Even knowing that changing my practice was right for me, I had to promote and put myself out there. In professional settings, this can be a gulp/deep breath moment. I remember when I was in a networking group a few years ago. We had to speak aloud and give 30-second and 60-second commercials about ourselves and our work. For the first few months, this caused me great concern: I never found the right things to say. I noticed myself fumbling over my words and tripping when answering questions. I wrote down so many pitches until it finally clicked. The “aha” moment was when I felt confident and realized I simply needed to talk rather than pitch. I often feel terrified to show the world what I’m doing. I begin to second guess myself and wonder about my decisions. Sometimes, I even feel like I’m drowning in a sea of shoulds and advice from other people. It’s gotten so common to put myself out there because of the ease of social media and at the same time, it’s become scarier and more competitive than ever. Everyone is a leader, a healer, a coach, or a guru. It’s easy to develop imposter syndrome. And I go through these cycles of wanting to avoid rejection, criticism, and confrontation. Then, I also have a conflict internally of having the desire to alert friends and colleagues of my goings on. I’m not about to announce that I’m gay. Or that I’m joining a commune. Or anything that some people might consider radical. But what I’m announcing is actually very radical to me. Despite my fear and worry about overt self-promotion, it’s time to share some news. I’ve bounced between wanting to be private and also needing to alert you. But, the desire to move forward , and thereby, share, is stronger than the desire to hide. You see, we all need support and help. And if I don’t share, you can’t aim to support me. So here goes. I’d like to take a moment to announce that while my individual practice is becoming more successful and growing, I’ve partnered with an amazing coach and we’re co-leading a group together. We have formulated a program called Here & Now & Next: The Mindset Program for Women Starting Something. Yes, it’s a long name. But it’s something we have put our hearts and souls into. My new partner, Kim Perkins and I met in a writing group. She put herself out there by posting about nonfiction writing and wanting accountability. Scheherazade and I replied to her inquiry and we began. Weekly, we started sending each other our writing and editing and discussing it. As I got to know Kim better, I learned about her coaching prowess and experience with leadership and groups. She learned about my clinical skills and individual practice. In December, I approached her about working together, but suggested she give it some time before saying yes or no. She said yes on the spot! We agreed to create a group together. Our work in planning, writing, making a curriculum and and discussing enrollment has gotten me so excited and ready to lead. And I feel like we are supporting each other in putting ourselves out there together. So what does this mean? It means we have a four-month program for women who need support for their projects. We address mindset – having an open-mindedness about problems and finding solutions rather than a fixed, or closed viewpoint. We will soon offer a similar program for men. The program has components of accountability, support, growth and community. We are also offering an open house for you to meet us and check us out. Even if you’re mostly sure you can’t do the program, we’d love if you attended the open house. It will be an afternoon of learning and growth for you. It’s on Sunday, April 9 in Pasadena. Message us at herenownext@gmail.com for more information. Even this post is scary to write. Part of me worries I’m putting myself out there too much by promoting and the other part says if I don’t share this, nobody gets the opportunity to participate. It’s a constant inner conflict. I see this with lots of my creative friends, amazing artists who struggle with money because they can’t/won’t promote themselves or don’t see value in their art. If only they’d share what they’re doing — they’d probably have greater success and more clients. I’ve learned that people don’t typically come knocking when they don’t know what’s offered behind the door. It’s important to place yourself in a window so people can see you. Then, the door bells will be rung. I’ve learned from my clients and now it’s time to show them that I face the same things. We all do. We suffer from fear of success, fear of failure, fear of putting ourselves out there — all of it is in our heads. We worry about being seen as vain. We don’t want to seem conceited. We want to show modesty. And yet, when we share something new and exciting, we are giving our friends, colleagues and peers an opportunity to refer. I encourage you to look deep within yourself and reflect on your process of “putting yourself out there.” Maybe it’s terrifying in the love/dating realm. Maybe professional aspects give you pause. Anyway you cut it, is it time to let go of the fear and try? For more information on the program, Here & Now & Next, please visit this page. I’m still absolutely accepting new clients. Email me at ninarubin@gmail.com. 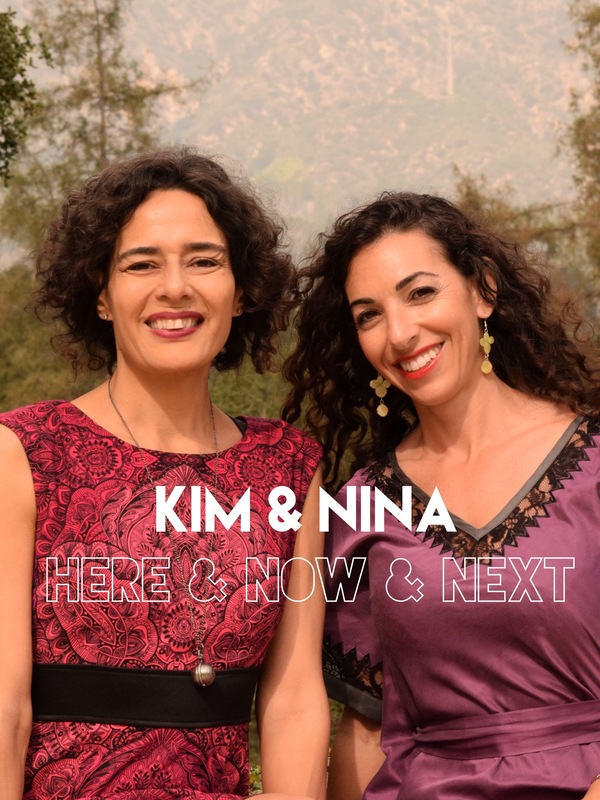 And if you have some questions about the program, please contact Kim or me at herenownext@gmail.com. Thank you in advance. I love this and I’m really excited for you guys!!! We appreciate your support and can’t wait for the open house! Hi Meredith! Thank you! I’m so happy to hear from you. I’m happy to be back in touch. Thank you for your support. First of all congrats on the New Business. I know from personal experience how scary it is to try something new; especially when you don’t have full control. In a way I feel that I’m at the stage you were before. I know that I need to make changes in my life. At the same time I don’t really know what I want, which seems to make things a bit more complicated. A LOT of this resonated with me (as you will see when we meet on Friday), and one thing I wanted to add that you didn’t quite mention is the illusion of “safety,” and how that affects all of the above. When I was a college counselor, I used to tell prospective students that came to me just wanting “a degree that makes me more money” that the only disciplines that fall into that category are medicine, law, or engineering, which I referred to as “safe” options. The thing I’ve since learned is that regardless of how “safe” the end result is in those disciplines, I find that doing them is actually very hard work, and I feel that if one doesn’t have the passion for them that gives them the ability to push through their difficulty, they lose their safety very quickly. The thing is, parents and other loved ones always push the safe options I think, because they care about us, but if you can’t actually do them, they’re just as unsafe as anything else. I think the option you’re passionate about and good at is actually the safest, because when the going gets tough, I find that people push harder with their passions.